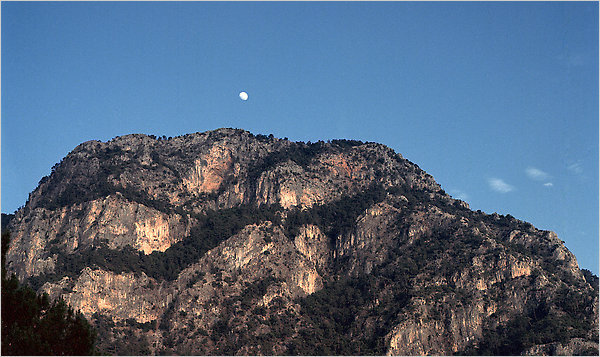 Mountains above the Kabak Valley fall to the Mediterranean. TO find the Kabak Valley, drive east along Turkey’s Mediterranean coast. Park your car when the pavement runs out, and walk (or hitch a ride on a truck) to a portal to another dimension. Just be sure you have a ticket. At least that is what Emine Altindal, one of the proprietors of the Shambala, a spiritually inclined eco-resort that clings to a cliff above an impossibly blue-rimmed half-moon of beach here, told me during a recent visit. “People who have a ticket come here,” she said. “A ticket? What kind of ticket?” I asked. “There is a protecting energy like wings of an angel over this place,” she said. This lush, secluded valley is a star gate, she explained, a door through which one leaves one form of consciousness and joins another. Perhaps. But it may be more likely that, as my partner, Candy, and I discovered last month when we spent several blissful days there hiking, swimming and staring out at evergreen-clad mountains flanking azure waters, it is merely one of the wildest, most remote and peaceful corners of one of the world’s bluest seas. Kabak Valley sits along the Lycian Way, a 300-mile-long hiking trail that snakes along a part of Turkey’s coast that was once Lycia, an important outpost of the Roman Empire. The rugged mountains that hug the coastline have long drawn tourists, many of them British, to what package vacation marketers call the Turquoise Coast. Charter flights deposit sun seekers at Dalaman Airport in droves, disgorging them to beaches in the resort towns of Marmaris and Oludeniz, where the reliable availability of a full English breakfast and a surfeit of beach loungers keep them coming. For these reasons this seemed an unlikely spot to find the kind of solitude we usually seek on vacation. Yet the combination of mountains and sea, especially that azure Mediterranean variety, had its own allure. After a bit of dissatisfied searching, we stumbled upon the quiet terrain of the Kabak. The valley has been a hidden favorite with hikers on the Lycian Way since the trail, parts of which date back thousands of years, gained popularity in the late 1990s. Arriving there, you can see why. From the main road a signpost points down a rough dirt trail through thick pine forest toward the glinting sea. In the last couple of years, getting to Kabak has gotten easier, with a road that leads down into the valley and several new and increasingly posh establishments bringing a touch of luxury to what might otherwise be a backpacker-only zone. We arrived the easy way, in a small white Hyundai sedan we had rented at Dalaman Airport. But the car couldn’t possibly make it down the rough road, so we called the Shambala, and they were kind enough to pick us up in a four-wheel-drive and take us halfway down the valley, to their resort. One look at the view from our room, a wood and glass bungalow that fairly floated on the cliff wall, and I understood all the spiritual talk. The Kabak Valley is a stunning and remote slice of wilderness. Ms. Altindal and her husband, Hulki Altug, built Shambala three years ago as an escape from their hectic life in Istanbul. “When we started to build this place it was something just for us and our friends,” she said. They named it for the mythical Himalayan city of Shambala. In the traditions of Tibetan Buddhism it was a magical city hidden high in the mountains where everyone had attained enlightenment. “We wanted to create our own version here,” Ms. Altindal said. The people at Shambala (theshambala.com) have all kinds of explanations for why the Kabak Valley is so special. It is one of only three places that did not freeze in the last ice age, they say. There is an energy vortex here, they insist. The good news is that mumbo jumbo is strictly optional. The slightly kooky spirituality, along with the peace-and-love vibe, is served up as a side dish, and you can take it or leave it. Even so, I was surprised to find it deliciously devoid of irony, and deeply endearing. And while the folks who run the place might be hippies, they run a tight ship: peace, love and dinner promptly at 8. Indeed, everything at the resort speaks to an exacting attention to detail, from the homemade organic olive oil soaps to the carefully designed bungalows and treehouses. Beyond the Shambala, the valley’s lodgings have gotten an upgrade. Simple backpacker camps have refined their accommodations as new seekers make their way there. One afternoon we had a delightful lunch of grilled fish at Shanti Garden (www.shantigardenkabak.com), one of several establishments on the valley floor, just behind the beach. Shanti Garden’s spotless but spartan bungalows are a less expensive alternative to the Shambala, and are much closer to the beach. Another nearby camp, Reflections, has a special focus on yoga. All our meals in the valley were simple in the best Mediterranean way — fresh ingredients, many of them grown locally, requiring little embellishment. The breakfast spread at Shambala in particular made me swoon: plump tomatoes adorned in local olive oil and thyme plucked from a nearby bush; hunks of homemade cheese; a sesame seed version of Nutella; leek-stuffed pancakes cooked on a wide griddle by an Anatolian granny; yeasty bread right out of the oven. But the main attraction here is nature. The valley spills out beneath Shambala. A short hike leads down to a beach of white sand and pebbles. During our visit, the water had a not unpleasant chilly edge, just enough to cut through the sweat of the hike down. A 15-minute swim led to a water-filled cave, where afternoon sunlight filtering through the blue sea illuminated a miniature cathedral of stone. The Lycian Way leads deep into the valley as it follows its course toward the city of Antalya. One afternoon we followed it up from Kabak’s beach, along the valley wall, drinking in the panorama of the Mediterranean with each switchback. After a couple of hours of heavy slogging, punctuated by breaks to enjoy the sea breeze and view, we arrived at a small waterfall that spilled into an icy, limpid pool. Sweaty from the climb, we stripped down and jumped in. The first electric jolt of mountain water was refreshing, but we didn’t linger. It was a long walk back to the beach, then back up the valley, to get back to our portal to bliss. A version of this article appeared in print on June 27, 2010, on page TR8 of the New York edition. Thank you, Lydia for such an interesting and informative post about Turkey.